I want to introduce you all to my “Irish Twins.” The guitar on the left was born in late Fall 2017 and is named “Jennifer Rose” which sold in February 2018. In August 2018 I built a new “Jennifer Rose” (pictured below on the right) which also uses a Jefferson’s Reserve stamp top. There are a few differences, including the darker headstock and chrome hardware on the 2018 model. 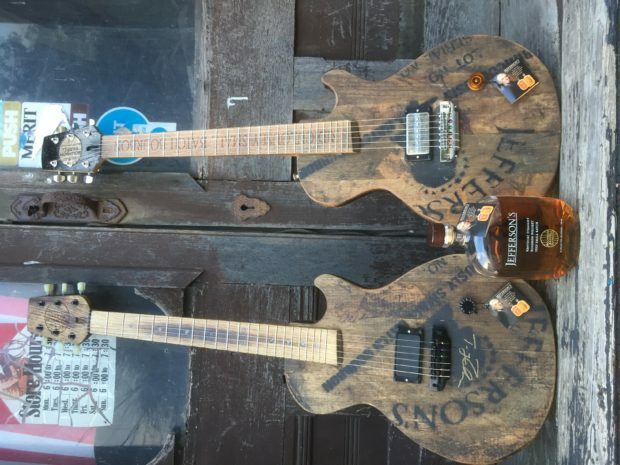 2018 “Jennifer Rose” uses Jefferson’s Reserve slogan “Ridiculously Small Batch Bourbon” as custom inlay on the fretboard. I like to think that I create ridiculously small batch bourbon barrel guitars and I am particularly proud of this one. If you want to see more of the 2018 “Jennifer Rose” (SN: 18004) check it out here. As of now this one is still for sale.